My suitemate has a very soft spot for ice cream. 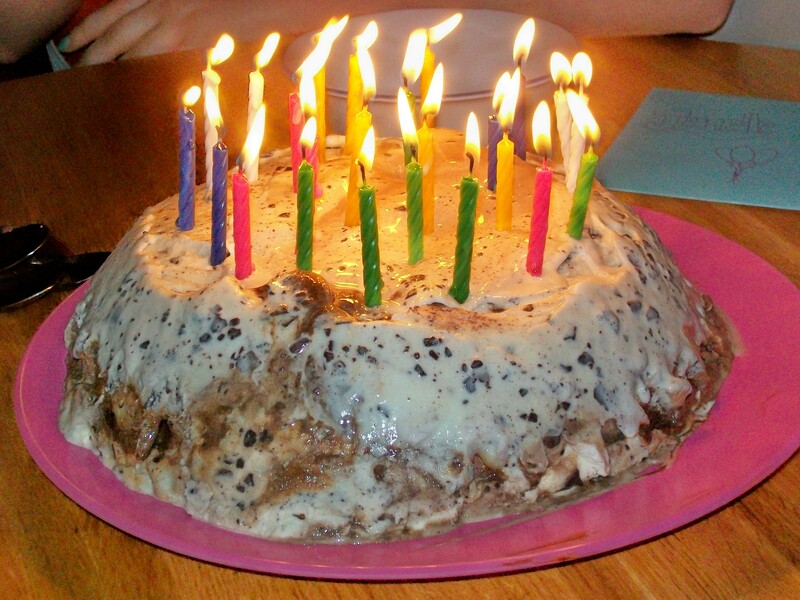 We were talking about what type of birthday cake she wanted, and she asked if I could make an ice cream cake. Of course, I replied, do you want something like Carvel’s? What’s Carvel’s, she asked. Oh dear. My heart stopped at that response and I had no idea what to say. 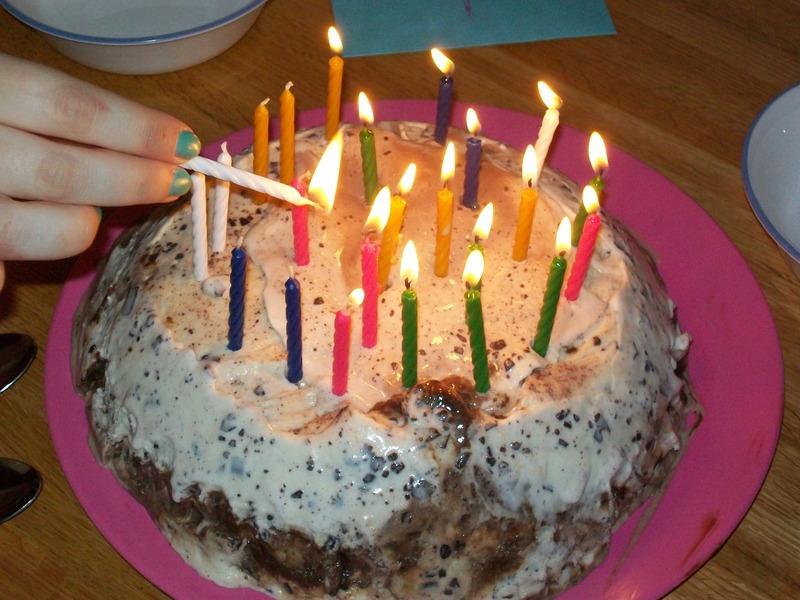 How could she have never heard of a Carvel ice cream cake? Fudgie the Whale? I guess it’s not as prominent on the West Coast. After this complete shock, I asked if she might like an ice cream bomb. I wasn’t as shocked that she’d never heard of this, so I tried to explain the concept. 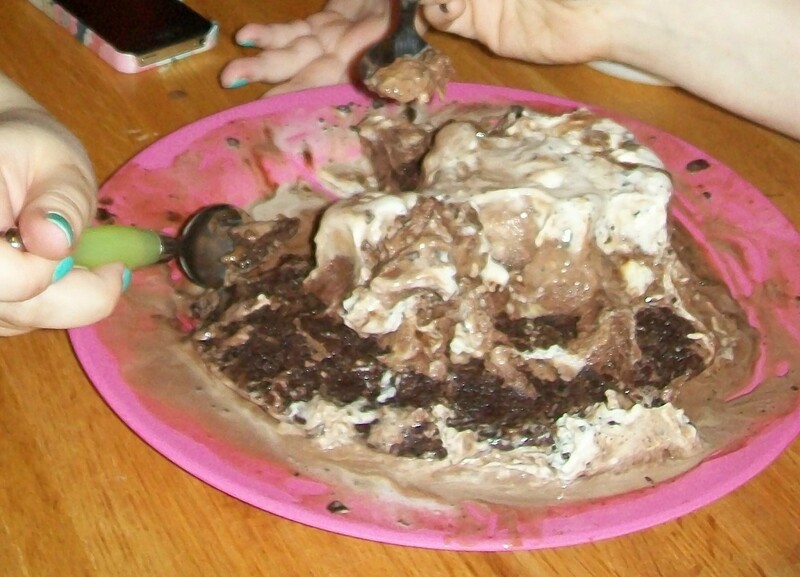 You layer ice cream and cake and anything you want in a bowl, and then you turn the giant frozen mound out onto a plate. This description resulted in her mouth hanging open in amazement because this proposed bomb was the perfect dessert for her. In the days leading up to its creation, she still didn’t completely understand what I was going to make, but she didn’t care as long as it had ice cream. I thought about what flavors to use, and settled on Half Baked, Starbuck’s Signature Hot Chocolate, and Trader Joe’s Mint Chocolate Chip. I also included a brownie base and fudge sauce between each layer of ice cream. It was going to be epic! Building the bomb went fine, but freezing it was another matter entirely. My other suitemate and I had gone to Trader Joe’s earlier in the day, and because she and my roommate don’t really cook, the freezer was full to capacity. So much so that we had a hard time keeping the door closed because it would always pop open when we closed the fridge. I thought we had shifted things around well enough to get the bomb to fit, but at the unveiling I realized I was wrong. Evidently the door was left popped open, so the bomb had been slowly melting all day, but I didn’t find out until I tried to turn it out onto the plate. Complete disaster. It was fine for a second, but then I swear time slowed down as we just watched it collapse into itself. Cue four freaking out girls and a rush to throw everything out of the freezer to shove the exploded bomb back in. In the brief time is was out of the freezer and then on the plate, it had melted all over the place and lost any shape it may have had. We were scared to open the freezer to check on it, in case it had spilled over even more. We had another problem because we had a ton of frozen items just sitting on our couch. Thankfully our RAs are fantastic and one of them let us put our things in her freezer. We let the bomb stay in the freezer for the rest of the night and vowed to try again the next day. I managed to coerce it back into the bowl and into a semi-dome shape, but by then the different ice cream flavors had sort of mixed, so the layer effect was lost. 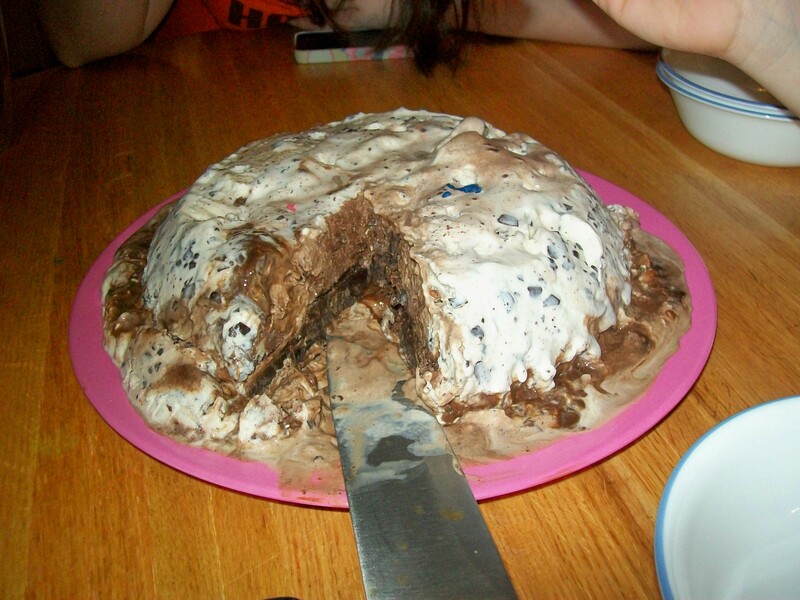 We sang Happy Birthday and got ready to eat, but we found that the brownie had also frozen rock hard, so I could barely cut through it. Not to be deterred, the four of us cast aside our bowls and dug right in with our spoons. It was delicious! 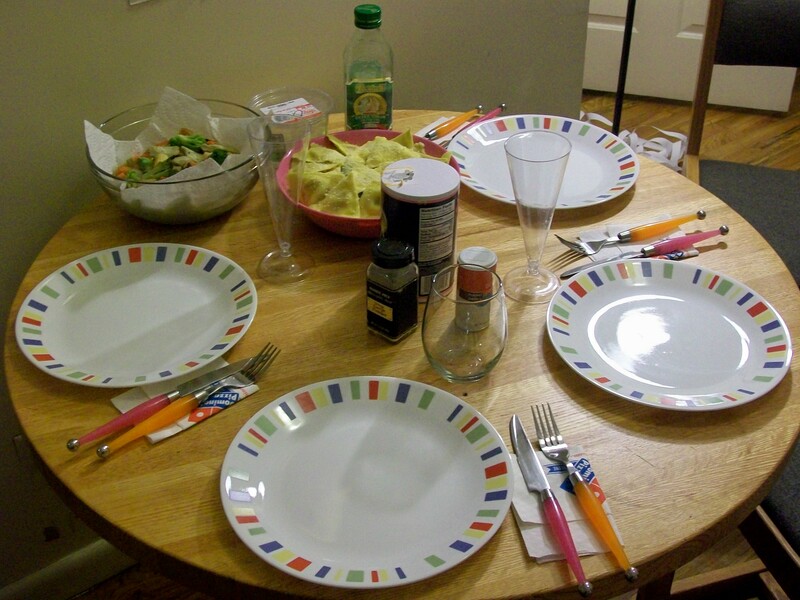 We also made a birthday dinner, which consisted of: Butternut Squash Ravioli, Spinach and Ricotta Ravioli, Parmesan and Arugula Ravioli, a vegetable mix, artichoke hearts, and my creamy garlic bread. Despite how good dinner was, dessert definitely out shined it. You just can’t compete with five pints of ice cream and a giant brownie!